At the White House, Trump blamed Democrats for the defeat of the bill. He noted that no Democrat supported the bill. 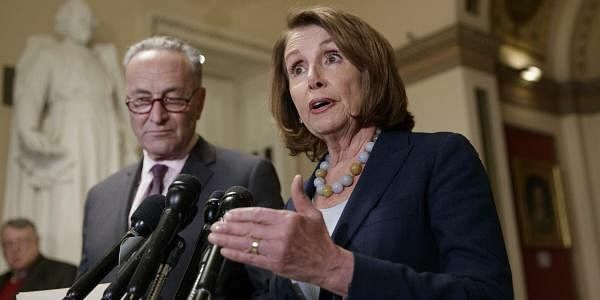 WASHINGTON: House Democratic Leader Nancy Pelosi is mocking House Republicans for failing to repeal and replace President Barack Obama's health law. Pelosi says, "We'll take credit for that." Speaker Paul Ryan says the collapse of the House Republican health care bill means former President Barack Obama's health care law will be around for the foreseeable future. The White House says it still remains optimistic about a troubled Republican-led health care bill to repeal and replace "Obamacare." White House press secretary Sean Spicer says President Donald Trump is looking forward to the House passing the bill and it expects the House to vote on the bill later Friday. Spicer says the president is meeting with House Speaker Paul Ryan to "discuss the way forward" on the bill. He says the president has "left everything on the field" on the bill. House Republican leaders were short of the votes needed for their health care overhaul bill hours ahead of a vote demanded by President Donald Trump. That's the word Friday from GOP lawmakers and congressional aides as Speaker Paul Ryan met with the president at the White House to deliver the sobering news. Separately, Vice President Mike Pence was meeting near the Capitol with recalcitrant members of the conservative House Freedom Caucus in a last-ditch effort to secure support. Rep. Mark Walker, R-N.C., told reporters, "As of right now, I'm not sure that we are across the finish line. We've still got three or four hours and there's still discussions happening." Democrats and some veterans groups say a provision of the Republican health care bill could raise costs for millions of veterans who use tax credits to buy private insurance. An amendment to the bill would make veterans who are not enrolled in government care ineligible for health-care tax credits. Republicans said the veterans' provision could be added back into the bill later. Democratic Sen. Tammy Duckworth of Illinois, who lost both legs in combat in Iraq, said Republicans either were "intentionally sacrificing veterans and putting them on a chopping block" or wrote the bill so "haphazardly" they don't know what's in it. Minnesota Rep. Tim Walz, the top Democrat on the House Veterans Affairs panel, called the GOP plan "shameful" and said it would leave many veterans without affordable insurance options. House Speaker Paul Ryan is at the White House to brief President Donald Trump on the state of play on the health care bill. The visit comes ahead of a planned showdown vote on the legislation later in the day Friday. The outcome was looking dicey with the legislation apparently still short of votes around midday, and few public signs that the situation was changing. A group of conservative hold-outs had yet to swing in favor despite lobbying from Trump and others, while opposition also came from moderate-leaning and rank-and-file Republicans. The legislation is the GOP's long-promised bill to repeal and replace former President Barack Obama's health care law. Trump decided Thursday that negotiations were over and it was time to vote. House Democrats are trying to make the vote on the House GOP health plan personal for their Republican counterparts. After each Republican speaks on the House floor in favor of the bill, Rep. John Yarmuth, D-Ky., cites the number of people in their congressional district who will lose health insurance under the bill. Under the bill, 24 million fewer people will have health insurance by 2026, according to congressional estimates. Rep. Clay Higgins, a Republican from Louisiana, proclaimed that a vote against the bill is "a vote against freedom." Yarmuth replied that the bill would result in 50,100 people from his Higgins' congressional district losing health coverage. Republicans disputed the numbers. They noted that Yarmuth got his congressional district estimates from the Center for American Progress, a liberal advocacy group. Republicans have pushed the GOP health care overhaul past an initial procedural hurdle in the House. That moves the chamber toward a climactic final vote that's a big gamble for President Donald Trump and congressional leaders. Friday's procedural vote was 230-194. The early vote inserted changes into the measure that leaders hoped would win over unhappy Republicans. It would improve Medicaid benefits for some older and handicapped people and abolish coverage requirements President Barack Obama's 2010 law imposes on insurers. It remained uncertain whether GOP leaders had enough votes to prevail on final passage. Conservatives complain the Republican bill doesn't do enough to erase Obama's law. GOP moderates are unhappy that it would cause millions of voters to lose coverage and boost medical costs for others. President Donald Trump says, "we'll see what happens," in response to a question about what happens if the vote on the Republican-backed health care bill fails in the House. Trump is offering his support for House Speaker Paul Ryan at a White House event announcing the presidential permit about the Keystone XL pipeline. Asked if Ryan should remain as speaker if the bill fails, Trump says, "Yes." The administration is trying to steer a GOP-backed health care bill through the House. The White House and Republican leaders say the vote will be tight and it's unclear if the legislation will pass. President Donald Trump is telling lawmakers who oppose abortion that a vote against the health care bill would favor Planned Parenthood. The president tweeted Friday, "the irony is that the Freedom Caucus, which is very pro-life and against Planned Parenthood, allows P.P. to continue if they stop this plan!" In a bid to coax support from conservatives, House leaders proposed a fresh amendment repealing Obama's requirement that insurers cover 10 specified services like maternity and mental health care. Lawmakers will vote later Friday. President Donald Trump is endorsing the Republican proposal on health care as "a great plan," ahead of a make-or-break vote in the House. The president tweeted Friday that "After seven horrible years of ObamaCare (skyrocketing premiums & deductibles, bad healthcare), this is finally your chance for a great plan!" The vote had been scheduled for late Thursday but was postponed after administration officials failed to convince skeptical conservative Republicans to support the bill. Trump claimed he was finished negotiating with GOP holdouts and determined to pursue the rest of his agenda, win or lose. Barring any further delays, the vote is expected to take place later Friday. White House budget chief Mick Mulvaney says he has "a lot of confidence" in President Donald Trump's ability to salvage a congressional Republican health care plan, but warns that Trump "also wants to move on" if the deal collapses. Mulvaney said Friday on ABC's "Good Morning America" of the president: "He's a tremendous closer. I wouldn't count him out." Mulvaney delivered a similar message to House Republicans Thursday night, warning that Trump would turn to other priorities such as a tax overhaul if the health plan pushed by House Speaker Paul Ryan is rejected by rebels in his own party. Mulvaney also rejected a new Congressional Budget Office analysis that warns the latest health plan version would reduce cost savings by $200 billion. "The CBO score is just wrong on that," Mulvaney said. A lack of women in a photo of negotiations over the GOP health care bill that was tweeted out by Vice President Mike Pence is drawing criticism from Democrats. The photo shows Pence at the center of a conference table during negotiations with the House Freedom Caucus. About two dozen men can be seen in the photo and not a single woman. Washington U.S. Sen. Patty Murray drew attention to the absence of women in the room by retweeting the photo and sarcastically adding, "A rare look inside the GOP's women's health caucus." A repeal of a maternity care requirement is among the concessions the Freedom Caucus is demanding in exchange for support of the bill.